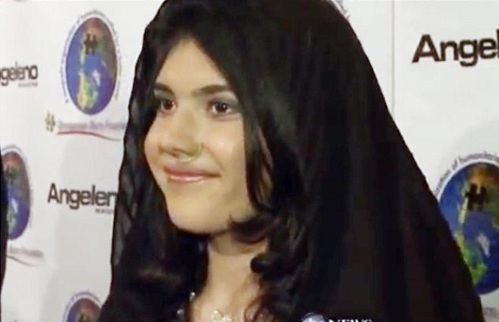 Aisha – the young women whose nose was hacked off by the Taliban who agreed to be photographed for a controversial Time magazine cover earlier in the year – has been given an Enduring Heart award in LA by the Governator’s wife, Mary Shriver. Aisha was wearing a prosthetic for the event, as she’s apparently still waiting for reconstructive surgery to begin. Best of luck to her. Anyone know what the ‘Angelena’ logo behind her in this shot from the event is?